Yoga for kids is becoming increasingly popular with kids yoga classes popping up everywhere — at yoga studios, in gyms, and even in schools! Our Kids Yoga Mat is extra thick at 1/4" and as wide as our deluxe yoga mat at 24 inches. Your children will love our whimsical design themes and want to tumble around on one: smiling sun (orange), butterflies (purple), or turtles (blue). These yoga mats for kids are cushy and thick (1/4") for those who like to play around on the mat. Kids yoga has tremendous benefits for the child. Yoga Practitioners everywhere know that yoga helps slow down the practitioner and help to concentrate. It makes perfect sense then to help a child find his or her center. The trick: You have to make it fun and approachable. We did both with our Kids Yoga Mat. Created with kid friendly animals and colors, your child can have a blast mimicking their favorite animal poses. Give your child a mat that's just their size. By making yoga fun for a child, you create a lifelong joyful habit. We offer wholesale pricing and quantity discounts for those buying in bulk. Please see our quantity pricing chart to checkout how much you could save! 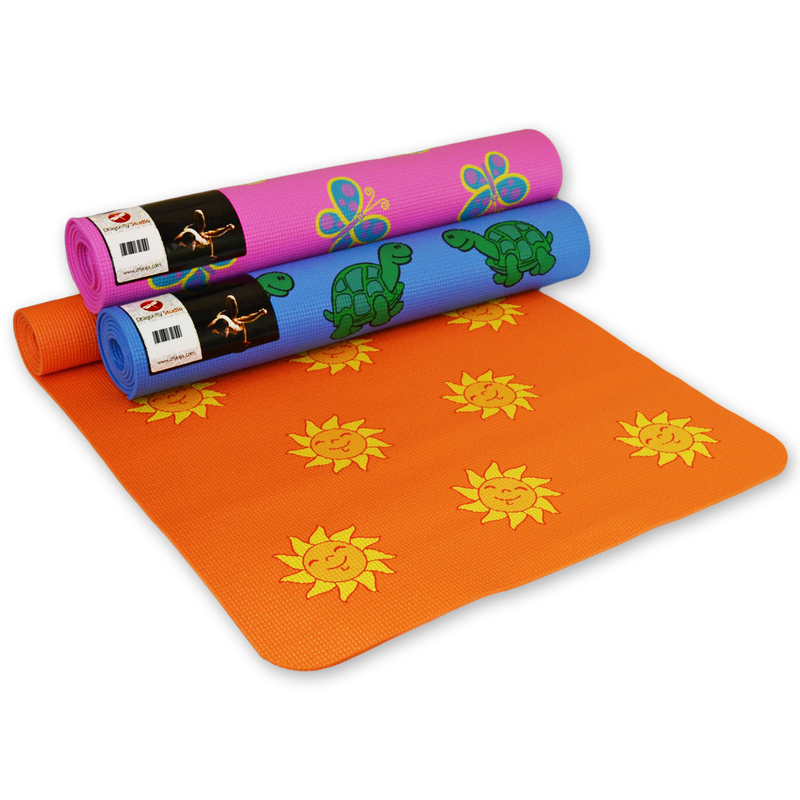 Our fun printed Kids Yoga Mats are the perfect size for yoga classes specially designed for children. Choose from three different bright designs: Orange with Suns, Pink with Butterflies, or Blue with Turtles. Like our Classic Yoga Mats, our Kid's Mats are made of durable foam with a high-tack surface for stickiness, and the rounded corners help to keep the mat in place on the floor while in use. Each mat arrives individually wrapped.